The route explores the geographic and ethnographic area of ​​the Neamţ River Basin, also known as Ozana. Hiking here is very exciting as as it implies crossing the territory of the Vânători-Neamţ Natural Park, one of the main touristic attractions of Neamţ County, characterized by a great variety of fauna and flora. Vanatori Natural Park is partially located between creeks Neamt and Cracau and hosts along with its important natural reservations, historic settlements. Here, tourists can visit the famous Neamt Stronghold, monasteries like Agapia, Varatec, Agapia Veche, Horaita, Neamt, Secu, Sihastria, hermitages like Sihla, Icoana Veche, Icoana Noua, Pocrov or Daniil Sihastrul and memorial houses like Mihail Sadoveanu, Ion Creanga, Alexandru Vlahuta or Veronica Micle. Inside the park there are natural reservations like the the Copper Forest, the Silver Forest, Dumbrava Oak Reservation and the Bison Reservation “Dragos Voda”. 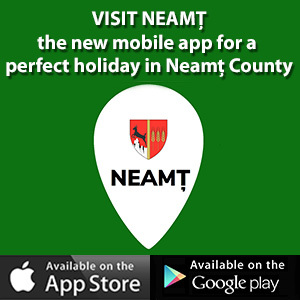 Come and visit Neamt County and you’ll find a special place, full of history and traditions. Such a place from Neamt County is Targu Neamt area. The town of Targu Neamt is considered to be one of the oldest from Moldova. In this location you can see 3 of the most visited attractions from Neamt County. Vanatori Natural Park was founded in 1999 and has a surface of over 30000 ha. The park offers numerous attraction points starting with natural wonders and up to cultural and historic attractions. Vanatori Park is located in Neamt County in the communes Cracaoani, Agapia, Vanatori, Targu Neamt town and Baltatesti resort and Oglinzi resort. Neamt County has the highest number of monasteries in the country and that’s one of the reasons for having so many possibilities for pilgrimages. The monasteries from Neamt County are also some of the oldest in Romania and they are located in places of rare natural beauty. The priests that lived here are famous in all Romania. For all these reasons pilgrims will have a special personal and spiritual experience when walking from one monastery to another.